Summer time is great for so many things! Among all the days of fun and play I like to sneak in a few days in the kitchen to get creative. Usually the rainy days, which here in Florida are quite common in the summer. During the school year I resort to granola bars quite often, not just for the kids but for myself as well. It is an easy to grab snack that packs a ton of nutrition and hold me over until the next meal nicely. The problem is that I can get quite picky with granola bars, it’s usually a whole process to pick the right one at the store. It involves a whole lot of label reading, comparing and then taste testing to find a good one, and not to mention I often spend quite a bit of money. Place dates in food processor and mix until puree. 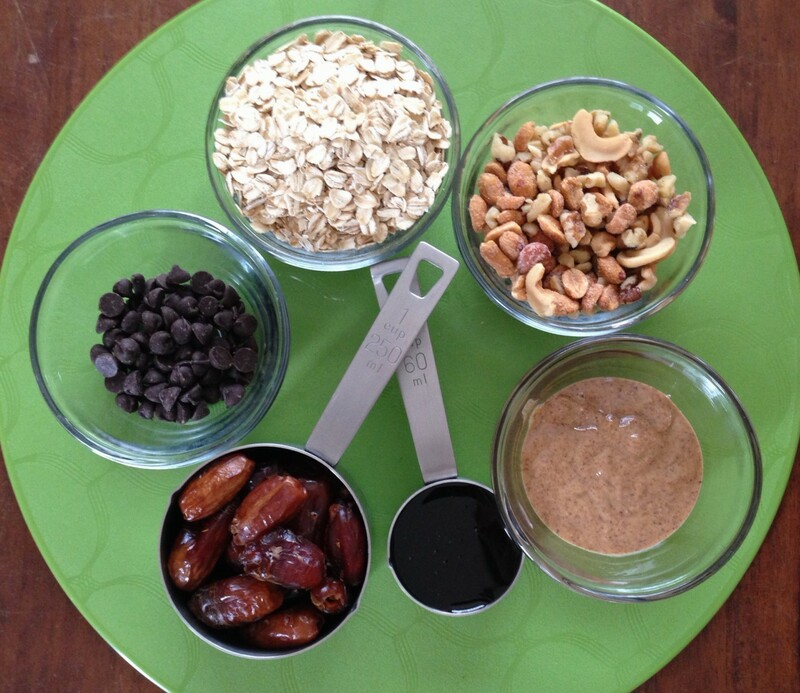 Add it to a large mixing bowl with oats, nuts and chocolate chips. Lastly add the honey and almond butter and stir it quickly. It helps if you slightly warm the honey and almond butter over the stove top. Then place it in 9×9 (or 8×8 for thicker) pan lined with parchment paper and flattened evenly. Place it in the freezer for 15-20 minutes to set, then cut into 10-12 bars. Keep them in airtight container in fridge or you may freeze them too!